World Series: Boston Red Sox, Los Angeles Dodgers, Game 2 Again, going to the bullpen in the fifth inning turns a close game for the Dodgers into a two-run Red Sox lead, and Boston's pitchers retire the final 16 Los Angeles batters for a 4-2 win in Game 2. Boston Red Sox starting pitcher David Price winds up to throw Wednesday night during Game 2 of the World Series against the Los Angeles Dodgers at Fenway Park in Boston. Dodgers relief pitcher Ryan Madson entered Game 1 of the World Series in the fifth inning with the score tied. Boston left the inning with a two-run lead. In Game 2 on Wednesday, Madson entered the contest in the fifth inning with the Dodgers up, 2-1, but the bases loaded. Madson walked the first batter he faced, then allowed a single to designated hitter J.D. Martinez that put two more Red Sox across the plate — his third and fourth RBI of the series. Boston left the inning with a two-run lead. Ryan Madson has inherited 5 runners this World Series (2 in Game 1, 3 in Game 2). All 5 have scored. The Dodgers, like many of Boston's opponents this postseason, struggle to close out innings: Nine of Boston's 12 World Series runs have come with two outs, as have more than half of the postseason runs over all. 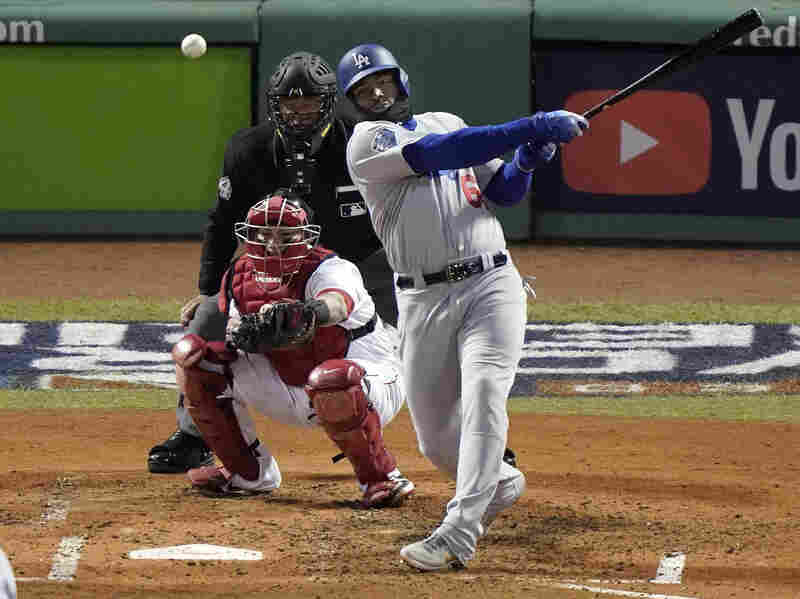 Los Angeles Dodgers' Yasiel Puig hits a single Wednesday night off Boston Red Sox starting pitcher David Price to drive in a run during the fourth inning of Game 2 of the World Series. For the Red Sox, the pitching was much more effective: None of the Dodgers final 16 batters got on base. Starter David Price has made it through six innings, striking out five and keeping his pitch count low, and relievers Joe Kelly, Nathan Eovaldi and Craig Kimbrel each had an easy inning of work as Boston won Game 2 by a score of 4-2. Price and the Dodgers' Hyun-Jin Ryu kept things mostly under control in the early innings of Game 2, but a hard double by Xander Bogaerts — which bounced so high off the Green Monster wall in left field that it would have been a home run in most ballparks — eventually led to Boston's first run. Mookie Betts went 3-4 in the game and added a run for the Red Sox. 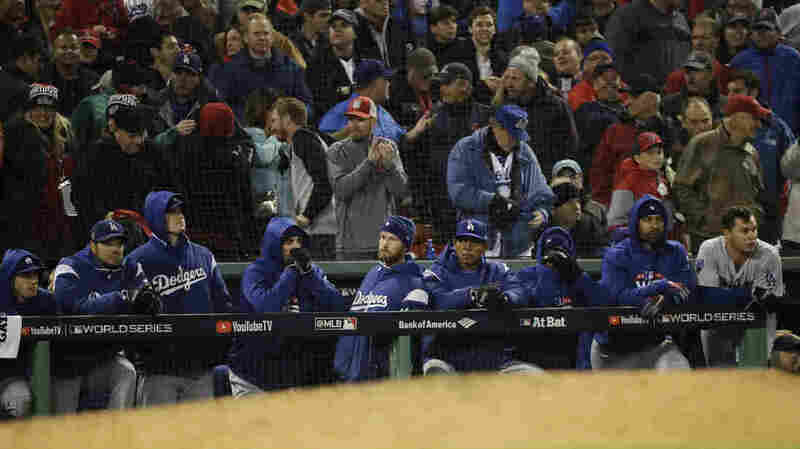 Los Angeles Dodgers watch the ninth inning of Game 1 of the World Series on Tuesday night at Fenway Park in Boston. The Red Sox defeated the Dodgers 8-4 to take the lead in the series. The Los Angeles Dodgers were soundly battered by Boston 8-4 on Tuesday night at Fenway Park. To even the World Series, they'll have to do the same to newly uncursed Red Sox starting pitcher David Price. 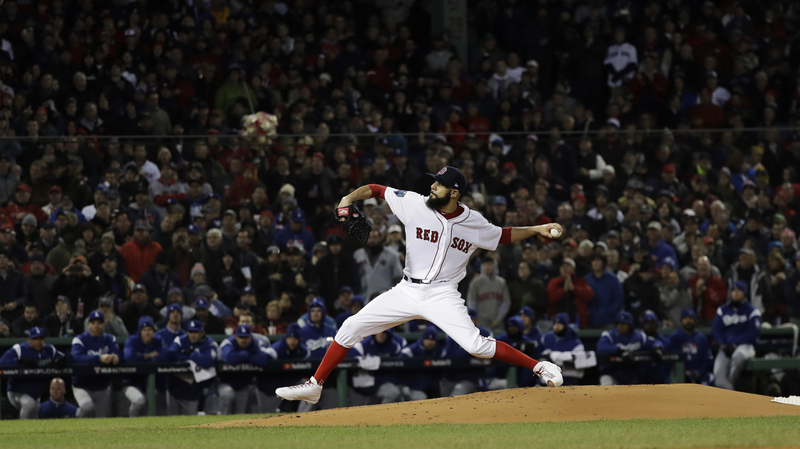 Before winning Game 5 of the American League Championship Series to send Boston to this year's World Series, Price hadn't had a postseason win in 11 tries. Los Angeles will also have to stop Andrew Benintendi (4-5, three runs) and the rest of the Red Sox lineup, who got to Dodgers ace Clayton Kershaw early in Game 1 and didn't let up. "He's their best and he's probably the best in the game," Red Sox starter Chris Sale said after the game. "So it just speaks volumes about our hitters and their approach. ... They never back down, they never give up. They don't care who's out there; they're grinding." "The Red Sox stole more bases than any team in the National League. They run well, not just wild. They were one of two major league teams — the Angels were the other — that were successful 80% of the time they tried to steal a base." Meanwhile, the Times notes, the Dodgers' catchers have been pretty terrible at throwing out runners attempting steals. Game 2 starts at 8:09 p.m. ET at Fenway Park in Boston and will be broadcast on Fox.